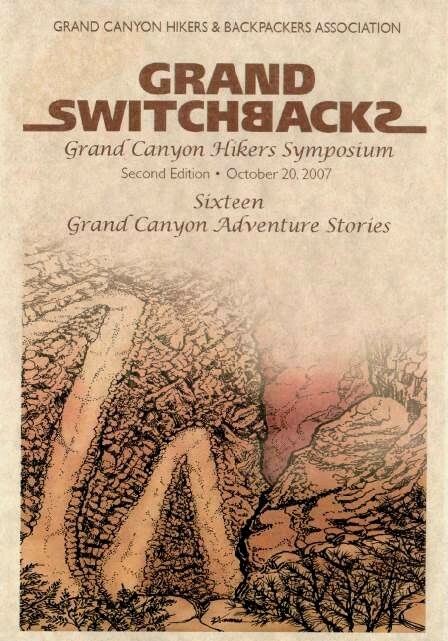 The GCHBA is pleased to announce the release of a DVD video showing the second Grand Canyon Hikers Symposium, which was held Saturday, October 20, 2007 at the Shrine of the Ages in the Grand Canyon National Park, South Rim Village. All 16 presentations are captured on 3 DVDs. The presentations cover a wide range of Grand Canyon experiences, including technical climbing, rim-to-rim hikes, exploratory hikes, and long-distance adventures. Chris Forsyth & Doug Nering: How Do We Cross the River? Chris and Doug traveled down the Tanner, crossed the river above Lava Chuar, went up Lava to the still site, visited the ruin in upper Lava below Chiavria Point, and up Chuar part-way over and down West Carbon. They camped at Butte Fault after trekking to Lava and back for water. They then headed up East Carbon up and down to the join of arms in Sixty-Mile and back to the river at Carbon for another ride across the river and out the Tanner. Standing at the Bill Hall trailhead with a full pack plus extra gallons of water, Jeri planted her feet hard to resist the gusts of cold wind determined to blow her over the edge. Way down below the rim lay the Esplanade. Their first campsite would be down there, somewhere. This backpacking adventure with the Grand Canyon Field Institute in September 2004 was led by geologist Christa Sadler. For six days the group hiked along Tapeats Creek, visited Thunder River Falls, dropped to the Colorado River, followed the river to Deer Creek, hiked up to The Patio, crossed Surprise Valley back to the Esplanade, and returned to the Bill Hall trailhead. The entire loop was about 22 miles plus the unmeasured miles of exploratory hikes on layover days. This adventure in geology revealed one of the most diverse and beautiful landscapes Jeri had witnessed so far in the Grand Canyon. Kathleen and Rob will speak about the Kanab Creek Wilderness: Snake Gulch to Sowats Point, April 29th to May 8th, 2006. This is a report about a cooperative backpack in the Kanab Creek Wilderness in Northern Arizona. These intrepid Sierra Clubbers backpacked down Snake Gulch to where it meets Kanab Creek, along Kanab Creek to the Ranger Trail 41. On the Ranger, they hiked to Lower Jumpup Spring and then to Mountain Sheep Spring before hiking out of the wilderness to Sowats Point. Eleven of them started the venture. By design, four hiked out Swamp Trail after four days. The remaining seven hiked the entire distance. Along the way, they encountered many pictos and lots of wilderness. It’s wild, lovely country. In nine days, they saw two people and no cows! This Labor Day 1975 hike started out as a three day trip that became four. Before the actual hike, Bob did a lot of researching and driving around just to even find the trailhead. Bob spent some time researching the route and eventually checked it out though the Kaibab to be certain that he could reach the lengthy Coconino talus slope below. The Kaibab section was a steep series of ledges but there was no place that required rope. Bob was convinced the boys that he had been hiking with could make it down to the LC using this route and immediately planned it as a three day Labor Day trip for the following month. That’s when things got kind of squirrelly. Everyone associated with Troop 800 wanted to go including the adult mothers, fathers, teenage daughters, and even a six year old. Fortunately Bob left his four year old at home. Starting at the Nankoweap trailhead, John and Wayne followed that established trail to Nankoweap Creek where it intersects the Butte Fault. Following the creek they reached the Colorado River and hiked downstream to the LCR where they procured a lift across the river from a group of researchers that were electrocuting trout and carp. They then proceeded up the LCR, visiting other research camps and passing the Sipapu, before arriving at the Salt Trail. They also saw the Emerald pool in Big Canyon and, of course, Blue Spring before exiting the LCR at the Horse Trail. Additional highlights include the granaries at the Nankoweap delta, trout fishing, conversations with the scientists/researchers, the difficulties of traveling upstream on the LCR from Big Canyon to Blue Spring and finding the exit trail. Jeff will speak about a 19-day backpacking trip from Friday, Oct 4 to Wednesday, Oct 23, 1968, on the east side of Shivwits Plateau. Jeff started near Mt Dellenbaugh, headed into the Parashant Basin, down Parashant Canyon to the River, along the River to Granite Park, and finally up 209/Indian Canyon to the top of the Shivwits and back to the car. Jeff day hiked exploring every side canyon on the right bank up as far as Jeff could safely go alone. Jeff spent a week camped opposite Granite Park so his hiking companion, Dave Bohn, could take photographs while Jeff hiked, usually up onto and off the esplanade. This presentation will be about a hike from Chamberlain Canyon to Kanab Point along the Redwall Bench. The hike on the Kanab Canyon Redwall bench was a “what if” type of hike. Could they make it? What would they find as far as views, water and past human activity? This presentation will be photo intensive, revealing all that was found. Unique views of the twists and turns of the meandering Kanab Canyon from the Redwall Rim. Photos of forgotten cowboy activities, unknown springs and landscapes that few have seen will be highlighted. Routes to the Redwall Bench will be explained and the mysteries revealed about the side canyons of Chamberlain, Flip Off, Rattlesnake Creek (Scotties Hollow), Red Ant and Battleship Point. Many Grand Canyon hikers have hiked down Kanab Canyon while only a few have hiked the Esplanade routes above. Nobody hikes the Redwall Bench route and this presentation will likely change that. Sean started the hike to Wotans about 5:30 am on July 29, 2006, and got a bit lost for an hour or so looking for the correct chute to rappel into, found the right area, rappelled twice and cached some water at the base. It took about 2 hours from the rim to this point (not counting our detours). Sean and his climbing partner walked around the fin base and found the scrambling section into the notch, found their way up and hiked west until reaching the 3rd or 4th bay that looked like it reached the top–a lot longer than they imagined. Sean made it to the top and took a few photos of Angels Gate and headed back. They drank a bit of their stashed water and jumared back up the ropes and made it to the rim around 7:30’ish. It was a long day but worth every sweaty step!!! On March 30, 2002 Cindy was hiking down to Horseshoe Mesa on a day hike with friends when about 2 miles down, her foot slipped off a rock and she broke her ankle. Cindy had already passed some of her friends already on the way up, but there were 2 or 3 that were still below her. They stopped to help and one of them raced to the top to alert the NPS emergency folks. Cindy’s friends became an excellent emergency response team, and took care of her for 4 hours until some NPS rangers arrived and took over. Cindy was helicoptered out, and then went to Flagstaff by ambulance. It was an eye-opener that it took so long to get rescued, not too far from the rim, even with timely notification to rescue personnel. Cindy’s presentation will concentrate on her experiences while waiting for rescue, the rescue procedure, and a bit about being prepared. Arnie will speak on the hike described in George Steck’s Loop Hikes II, chapter 3, which leads down Mile 150 Canyon to the river, upriver to Kanab Canyon, up Kanab to Scotty’s Hollow, and up Scotty’s Hollow to the rim – approximately 25 miles of hiking. In October of 1997, Arnie and four others made this hike, and after 40 years of Canyon hiking, it remains one of the toughest and most interesting Arnie has ever done. The hike included an old cowboy trail, rappels through a redwall slot canyon, a difficult traverse along the Colorado, a sloggy walk up a swollen Kanab Creek, and a rough hand-over-foot climb up the rim cliff. The group had weather ranging from hot and humid to bright and sunny to overcast and rainy, and drove through an electrical storm with hail as they departed the rim. It was truly a complete package. Late Spring 2001, John Stark and Jim Bush dry camped for one week on Powell Plateau. Reports by Euler, Butchart, and Covington helped them navigate the place Zane Grey called “the most isolated, inaccessible and remarkable mesa of any size in canyon country.” On Powell Plateau they found old growth Ponderosa Pine forest, archaeology sites littered with pottery, corrals left behind by Uncle Jim Owens, mountain lion runs, and the vista painted by Thomas Moran. They mapped the Plateau, explored the Blacktail Valley, and took an overnight trip to remote Ives Point. Sally will present on a hike which she has come to call the “High Saddles Hike”. Sally and her team went from the south rim to BA and then over to Lava/Chuar, using all the high saddles in between (Wotan’s/Angel’s Gate, Vishnu/Unkar, Unkar/Lava/Chuar. They secured a ride across the river and came out the Tanner. John Azar, Al Astorga, and Debra Van Winegardener were her companions. This presentation is on a 5 day rim to rim to rim on the corridor trails, night one at the Bright Angel Campground, nights two and three at Cottonwood, night four back at Bright Angel and hike out on the fifth day. This was done 15-19 April, 2007. The teens are seniors in High School, from Rhode Island. Hank leads us on a hike to Redwall Cavern, going down the shortcut route via Bedrock Canyon into South Canyon, hiking down along the river until right across from Redwall Cavern, then paddling across the river in an inflatable, and going back the same way. Angie and Annette spent 5 days hiking the Tanner to the Grandview, May 2007. While the Papago Wall was not too bad, the 50 mile-per-hour wind was more of a stopper then any wall. We met some great fellow travelers who shared their dinner and whiskey with us, the cactus were in bloom, the weather was perfect less the wind, and we seemed to be having a lot more fun than the river runners we met up with. In October of 2005, Andy Bates and Tom Martin attempted to climb Vishnu Temple in a three day backpack off Cape Royal. This ascent would be 60 years after the first summit of Vishnu Temple by the father and son team of Merrel Dare Clubb and his son Roger in 1945. Andy Bates and Tom Martin made the summit, where they matched a summit photo taken on the first ascent in 1945. Tom was able to visit with and interview Merrel Clubb’s last surviving son, who is now 82 years old and living in Missoula Montana. Merrel Jr. was able to sort out a little more history about his dad’s three Vishnu attempts, and unravel a little more about the four generations of Merrel Dare Clubbs. This presentation includes some original Merrel Clubb photographs of Vishnu Temple from the Clubb family archives.